“If there is a will, there is a way.” This maxim is true about Professor Sugata Mitra who opened a solar-powered virtual school for children living below the poverty line in the dark interior or rural Bengal. His independent, solar-powered learning lab, ‘School in the Cloud’, reached out to a village named Korakati in the mangrove swamps of Sundarbans by the Bay of Bengal, where the rural economy consists of fishing, farming and forest harvesting. Sugata Mitra is a professor of educational technology at the School of Education, Communication, and Language Sciences at Newcastle University. A leading champion of minimally invasive education, he has a PhD in physics and 25 inventions in education technology to his credit. 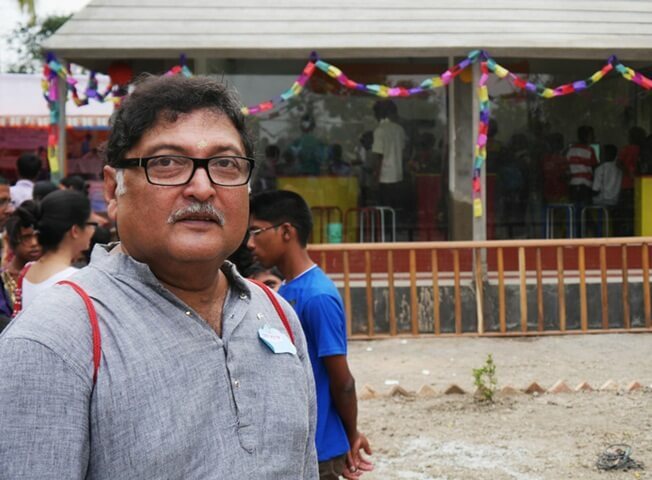 The first solar-powered virtual school in Sundarbans, 110 kms from Kolkata, is a result of Professor Sugata Mitra’s 14 years of research on whether a group of children given access to Internet could learn by themselves. He has continued his journey since he conducted the first experiment in a Delhi slum in 1999 when he was the chief scientist at NIIT. He left a computer with Internet connection in the slum and noticed to his utter surprise that a group of slum children learned how to use the computer with no one’s help and without knowing English. Based on his belief in Swami Vivekananda’s words, “You have to grow from the inside out. None can teach you, none can make you spiritual. There is no other teacher but your own soul,” Professor Sugata Mitra’s independent learning lab with self-organized learning environment (SOLE) came to be known as ‘Hole in the Wall’ in 2013. Korakati’s School in the Cloud in Sundarbans is one of the seven locations with self-organized learning environment, which Professor Mitra has spotted in collaboration with Microsoft, Newcastle University in the UK and others. He funded the project with his TED prize money worth 1 million dollars. The self-organized learning environment enables children to use online resources to learn and experience by themselves. It helps them improve their reading, speaking and comprehension skills. Professor Sugata Mitra’s School in the Cloud in Sundarbans engages children with several constructive activities in a bigger world online. It also connects the children with ‘grannies’, a group of retired teachers from across the world, who teach and mentor underprivileged children through Skype. When a local schoolteacher from Korakati approached Professor Mitra to brighten the lives of his village’s underprivileged children, Professor Mitra found it an opportunity to build a School in the Cloud in rural Bengal. Korakati’s School in the Cloud amidst huts in mangrove swamps is a standalone model of self-organized learning environment (SOLE). Equipped with a 40-feet bamboo tower receiver for Internet bandwidth, the slower-powered virtual school has 150 students who come from different parts of Sundarbans. Some students come to school by walk while some others paddle bicycles for miles to reach school. The children are divided into groups and each group is given access to an educational website at a time. They use Google translator to understand tough English words in Bengali. They are given a topic for online research every day. Thus they surf Internet, browse education portals and collect information on their own. The impact of Professor Sugata Mitra’s School in the Cloud is visible in the children’s day-to-day performance and development, which is documented regularly. Motivated by this new-age learning system, the children are educating themselves on English language, comprehension, collaboration, online research and Internet literacy with flying colors. Professor Sugata Mitra is confident that his project ‘School in the Cloud’ will work anywhere, on seeing the success of its standalone model in Sundarbans. Travel Beats by IndianEagle is a digital publication for Indian Diaspora to keep up with news and stories of India. Subscribe to Travel Beats’ free newsletter and receive exclusive stories on time. Iwant to give some of my school books of class 9and also some of my and my brothers clothes .